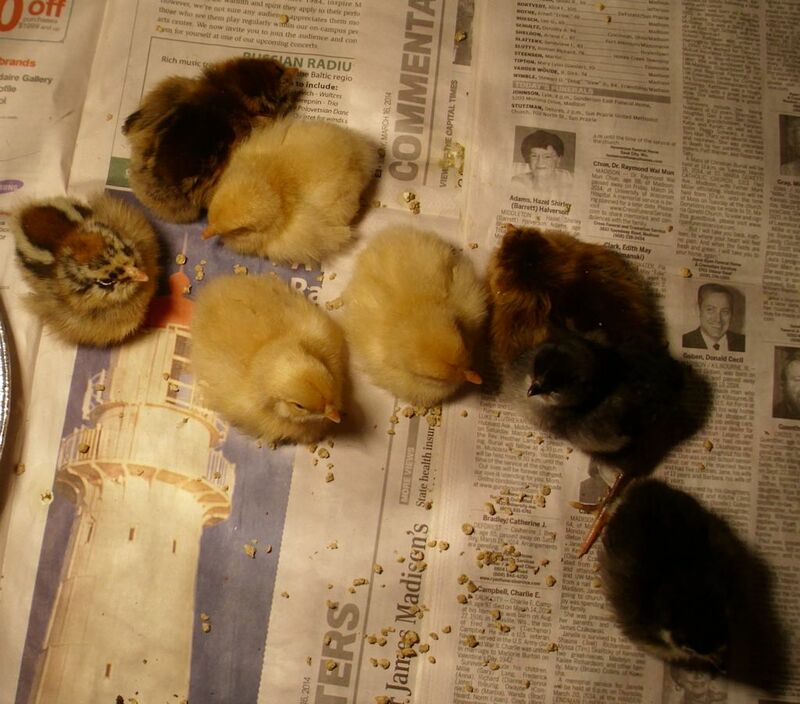 The eight new chicks include three Americaunas (multicolored brown in the picture), three Buff Orpingtons (light brown/yellow), and two Barred Plymouth Rocks (black with gray bellies). I’ve had good success with Americaunas in the past. They lay eggs three or four times per week, the eggs are usually large to jumbo, and I’ve only had one get broody on me once. Of all my chickens, the Americaunas are actually the friendliest and seem to demand the most attention. The Buff Orpingtons are the most consistent winter layer in my coop. I have had them get broody on a regular basis, but they make up for their vacations from laying by laying more eggs when they do. The size range of the eggs from this chicken goes from medium all the way up to a super jumbo that pegs my egg scale. Although they don’t demand attention, the Buff Orpingtons are quite friendly and get along with the other chickens really well. The Barred Plymouth Rocks are a new addition. I wasn’t happy with the Delaware hens I purchased. They do lay regularly and the eggs are quite pretty (the only speckled eggs I get). In addition, they seem to be the least likely to have problems during the winter months and they lay almost as often as the Buff Orpingtons do. They also tend to waste less food and eat less as well. However, the eggs tend to be a bit smallish and range toward medium. The Delaware hens also tend to get a bit rowdy with the other hens and the worst part is that they tend to be egg eaters. After talking with a number of other people, I decided to give the Barred Plymouth Rock a try. Because I don’t have meat chickens this time, I had to set the brooder box up a little differently. 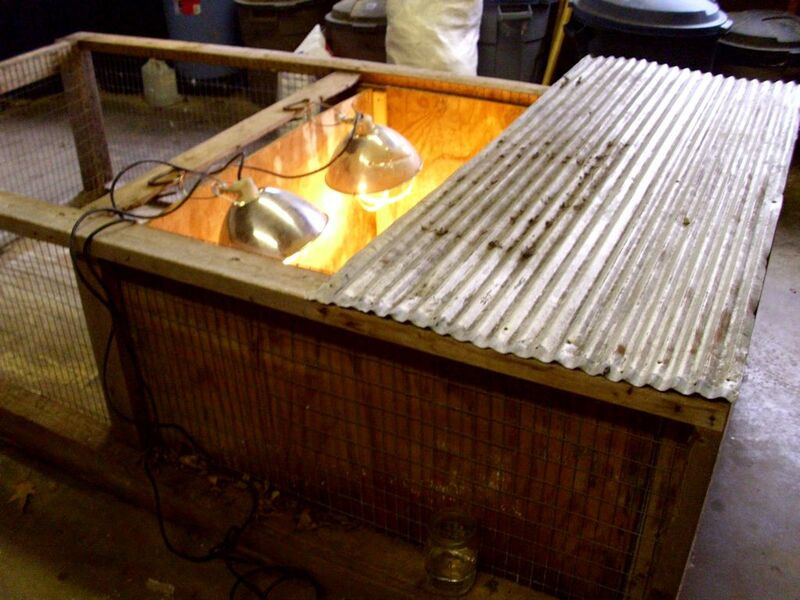 There are only eight little chicks in a great big box so I set both of the heat lamps at one end of the brooder box. I also placed a metal cover over the other end to help keep the heat in better. The new arrangement is working fine—the chicks are staying quite warm and cozy despite the lack of companions (normally 75 of them). The big thing I’m watching for now is that the chicks continue to remain active and don’t show any signs of being cold. Of course, that means getting up at night as well. At this point, I’m getting up two or three times during the night hours to check on them and I also check on them regularly during the day hours. Handling your chicks at this point is a good idea. Don’t hold them for long because you don’t want them to get cold or to have other problems that come with a bit too much attention. You do want to pick each chick up every day so they get used to being handled. Make sure you talk with your chicks as well so they get used to the sound of your voice. Tame chickens are most definitely easier to care for and a real delight as companions when you work in the yard. Let me know your thoughts about laying hen chicks at John@JohnMuellerBooks.com.